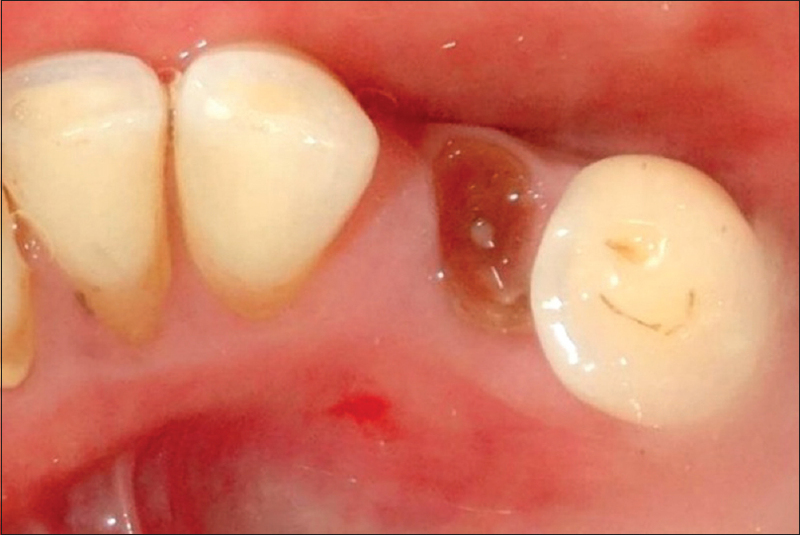 Background: Currently, the leading theme in mucogingival surgery is the correction of gingival recession defects. Free gingival graft (FGG) has been successfully in use in this category of reconstructive therapeutic modality. 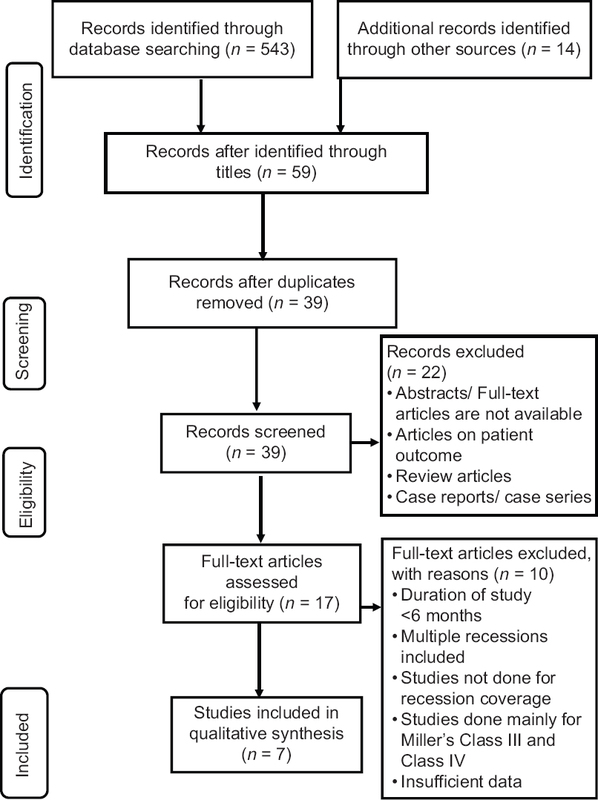 Objectives: The aim of this systematic review was to evaluate the literature with respect to efficacy of FGG in the management of Miller Class I and II localized gingival recessions. Data Sources: Search strategies were performed via electronic database which included Pubmed-Medline, Google scholar and manual search using University library resources. Two reviewers assessed the eligibility of the studies. Study Eligibility Criteria: Controlled clinical trials, randomized clinical trials and longitudinal studies evaluating recession areas treated by FGG with minimum of 6 months follow up were included. In-vitro and animal studies, studies mainly done on Miller Class III and IV gingival recession defect, studies on multiple gingival recessions and case series and case reports were excluded from the search. Results: The electronic and manual search identified a total of 557 articles. A final screen consisted of 39 articles out of which 17 articles were selected for full-text assessment. Finally, 7 articles were selected for detailed evaluation for this systematic review. FGG has shown significant results in all the studies except for one study. Conclusion: FGG produces substantial results, however, highly depends on the case selection and operator's skill and experience. FGG gives an impression of being the best alternative option in zones where gingival recession presents with inadequate width of attached gingiva and depth of vestibular fornix. Background: Vitamin D, an important hormone required by the body, exerts its biological effects through Vitamin D receptors (VDRs) present on target cells. Vitamin D is ineffective in tissues which lack VDR. Various tissues show the presence of VDRs. However, evidence for the presence of VDRs in human periodontal ligament tissue in fully erupted teeth in adults is lacking. The present study intends to evaluate the presence of VDRs in periodontal ligament (PDL) tissue and assess their response to serum Vitamin D3 levels in chronic periodontic patients. Materials and Methods: A total of 19 chronic periodontitis patients were enrolled in the study and tested for serum 25(OH)D3 levels. Deficient patients were supplemented with Vitamin D3. PDL tissue of these patients was isolated after tooth extraction before and after supplementation of Vitamin D3 and analyzed for the presence of VDR in PDL tissue by using enzyme-linked immunosorbent assay. Results: All the chronic periodontitis patients were found to be deficient in Vitamin D3. 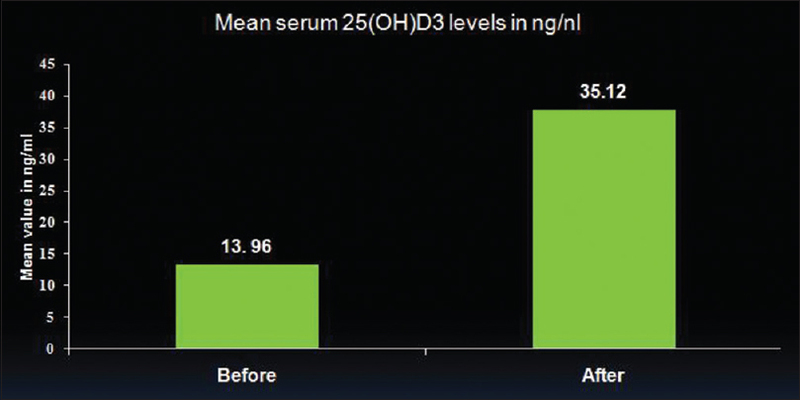 The mean serum 25(OH)D3 level before supplementation was 13.96 ng/mL which significantly increased to 35.12 ng/mL after supplementation of Vitamin D3 for 6 weeks. VDR analysis determined mean VDR conc. in PDL tissue to be -1.443 ng/mL, which increased to 2.38 ng/mL after supplementation. A concentration dependent correlation was seen between serum 25(OH)D3 levels and VDR conc. in PDL tissue after supplementation. Conclusions: The study determined Vitamin D Receptors (VDR) in PDL tissue after supplementation of Vitamin D. Thus in addition to the standard treatment modalities, Vitamin D3 supplementation would be an important factor for generation of adequate immune response. Background: Periostin, a matricellular protein, is downregulated in chronic inflammatory periodontal disease and is negatively modulated by tumor necrosis factor-α (TNF-α) in human periodontal fibroblast cell culture. The study aimed to estimate the gingival crevicular fluid (GCF) levels of periostin and TNF-α and to discern their relationship in chronic periodontitis (CP) individuals with and without Type II diabetes mellitus (DM). Materials and Methods: A total of 60 participants were divided into three groups, with 20 in each group. Group I – systemically and periodontally healthy, Group II – generalized CP, and Group III – generalized CP with Type II DM. 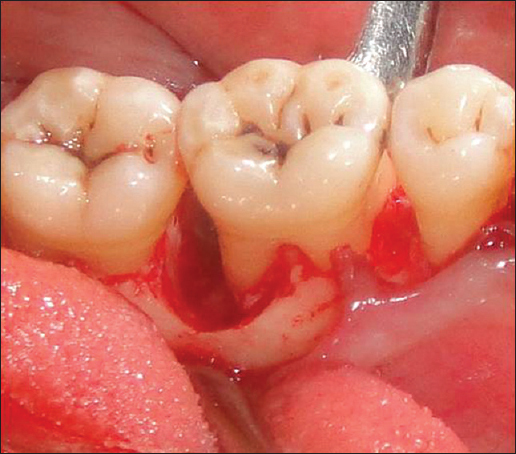 Plaque index, gingival index, sulcular bleeding index, probing depth, and clinical attachment level were recorded. GCF periostin and TNF-α were quantified using the enzyme-linked immunosorbent assay. Results: Intergroup comparison was performed using the one-way ANOVA and Kruskal–Wallis. The relationship between the variables was analyzed using the Pearson's and Kendall's Tau correlation. The GCF periostin levels in Groups I, II, and III was 27.52 ± 2.39 ng/mL, 20.18 ± 1.42 ng/mL, and 16.77 ± 3.29 ng/mL, respectively. The GCF TNF-α levels in Groups I, II, and III was 92.41 ± 19.30 ng/L, 118.53 ± 21.93 ng/L, and 147.67 ± 16.35 ng/L, respectively. 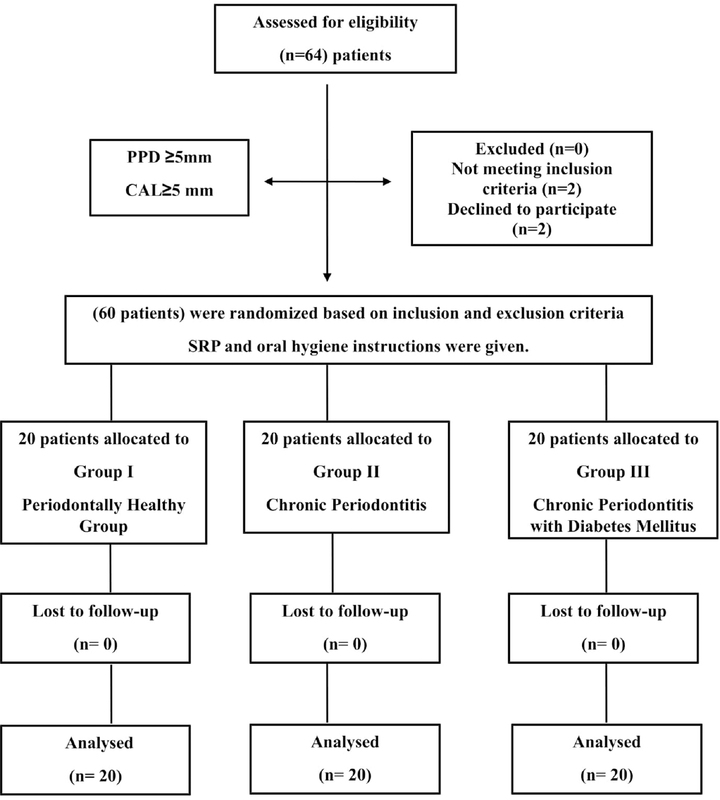 Periostin decreased, and TNF-α increased in periodontal disease; moreover, periostin level correlated negatively with all the site-specific clinical parameters whereas TNF-α positively correlated (P < 0.001). Conclusions: TNF-α strongly and negatively downregulates periostin in a chronically inflamed locale leading to compromised integrity of the periodontium. Background: Collagen and chitosan are potential biomaterials for medical applications; chitosan-collagen membranes are used as a barrier membrane in guided tissue regeneration and guided bone regeneration. Aims: The purpose of this study was to analyze the effect of the chitosan-collagen membrane on wound healing in rat mandibular defect by counting the number of fibroblasts and new blood vessels. Materials and Methods: As much as 24 male Wistar rats were divided into two groups, the treatment and control group. Bone defects were made In the rat mandible with diamond bur with a diameter of 2 mm, then the defect was covered with a chitosan-collagen membrane, and the control group was covered without application of chitosan-collagen membrane. After the 3rd, 7th, 14th, and the 21st day, the defect site was analyzed histologically. The number of fibroblasts and blood vessels was counted under a light microscope, at five fields with ×1000 and ×400 microscope magnification. Statistical Analysis Used: This study was done by using analysis of variance and unpaired t-test. Results: The average number of fibroblasts and blood vessels in the treatment group was higher than the control group. There was a significant difference in the number of fibroblasts on the 3rd and 7th day (P = 0.001; P = 0.001) and the number of blood vessels on the 3rd day (P = 0.04). Conclusion: The chitosan-collagen membrane was able to increase the number of fibroblasts and new blood vessels in the wound healing process. Background: Chlorhexidine (CHX) is an antiseptic mouthwash widely used as the gold standard for inhibiting plaque formation. However, the bitter taste of CHX limits patient compliance. We developed a 0.12% CHX and 1.5% hydrogen peroxide (H2O2) mouthwash that masked the bitter taste of CHX. This study evaluated the antibacterial activity and subject satisfaction of the developed mouthwash. Materials and Methods: Three mouthwashes were used as follows: (1) a commercial 0.12% CHX mouthwash, (2) a prepared 0.12% CHX mouthwash containing 1.5% H2O2, and (3) a prepared 0.12% CHX mouthwash. 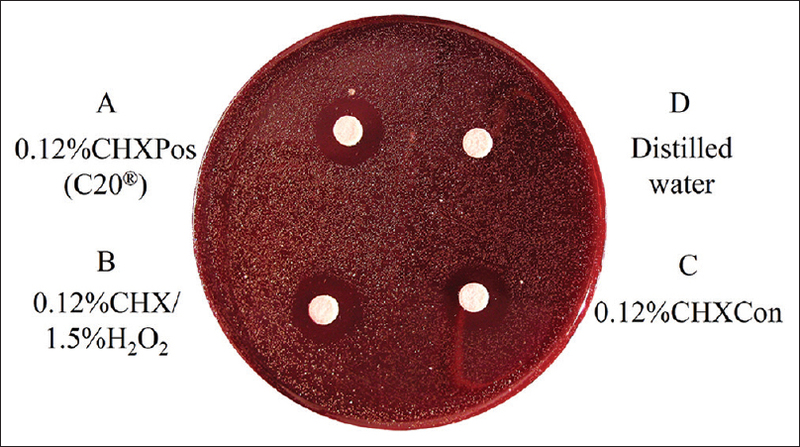 A disc diffusion assay was performed to determine the antibacterial activity of each mouthwash against Porphyromonas gingivalis and Aggregatibacter actinomycetemcomitans. To assess subject satisfaction with each mouthwash, a satisfaction questionnaire was completed immediately after rinsing with each mouthwash. Results: The antibacterial activities of the three mouthwashes were similar. Moreover, the questionnaire results revealed that the level of satisfaction was significantly higher for the 0.12% CHX/1.5% H2O2 mouthwash compared with the other mouthwashes. Conclusion: The 0.12% CHX/1.5% H2O2 mouthwash revealed a similar antibacterial activity as the CHX standard against periodontal disease pathogens. In addition, the subjects were more satisfied with the new formula compared with 0.12% CHX alone. These data suggest that the 0.12% CHX/1.5% H2O2 formulation is an alternative antibacterial mouthwash to avoid the unpleasant CHX side effects. Aims: Presence of bacteria within the environment of infrabony pockets affects healing during their treatment. Present investigation utilized a diode laser for pocket sanitization before the placement of bone biomaterial with the aim of enhancing the healing. Materials and Methods: Twelve patients with bilateral intrabony defects participated in a split-mouth study design. Control group received biomaterial application only after surgical debridement. Infrabony pockets in the test group were irradiated with 810-nm diode laser at 0.8 W, continuous wave for 20 s before surgical debridement and biomaterial application. Healing was assessed using clinical and radiologic parameters. Results: Control group showed mean probing depth (PD) reduction of 3.25 ± 0.62 at 3, 4.08 ± 0.90 mm at 6 months. 3.00 ± 0.73 at 3, 3.91 ± 0.66 mm at 6 months reduction in mean PD was seen in the test group (P < 0.001). No statistically significant differences between the groups were observed. A gain of 2.50 ± 0.67 at 3, 3.25 ± 0.62 mm at 6 months in relative clinical attachment level was seen in the control and of 2.33 ± 0.77 at 3, 3.16 ± 0.57 mm at 6 months in the test group (P < 0.001) without significant differences between groups. 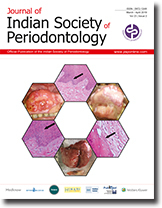 1.33 ± 0.57 and 0.95 ± 0.68 mm hard-tissue fill (difference in the radiographic distance between cementoenamel junction and base of the intrabony defect pre- and post-operative) at 6 months was observed in the control and test groups, respectively (P < 0.001). Between groups differences (0.22 ± 0.24 mm) were not significant. Conclusions: Similar reduction in soft- and hard-tissue parameters in both groups indicates that adjunctive pocket sanitization with diode laser did not improve the healing of intrabony defects treated with bioactive glass. Aim: The present study is aimed to investigate whether single-nucleotide polymorphism (SNP) of resistin gene (RETN) at −420 and +299 sites, is associated with resistin levels in serum and gingival crevicular fluid (GCF) in periodontally healthy, chronic periodontitis (CP) with and without type 2 diabetes mellitus (T2DM) patients. Materials and Methods: Serum and GCF samples were procured from all the 60 patients (twenty in each group) of the three study groups i.e., periodontally healthy (Group I), CP (Group II) and CP with T2DM patients (Group III) to analyze resistin levels using enzyme-linked immunosorbent assay test and clinical parameters were assessed at baseline and at 3 months after scaling and root planing (SRP). RETN polymorphism at −420 and +299 was genotyped by polymerase chain reaction-restriction fragment length polymorphism technique. Results: Patients with SNP −420 and +299 were positively correlated with increased serum and GCF resistin levels in Group II and Group III patients. SRP led to substantial reduction in the serum and GCF resistin levels. Conclusion: These findings are suggestive of a biologic link between resistin, periodontal diseases, and periodontal diseases with T2DM and RETN SNP at −420 and +299 in imparting increased resistin levels in inflammatory and diabetic conditions. 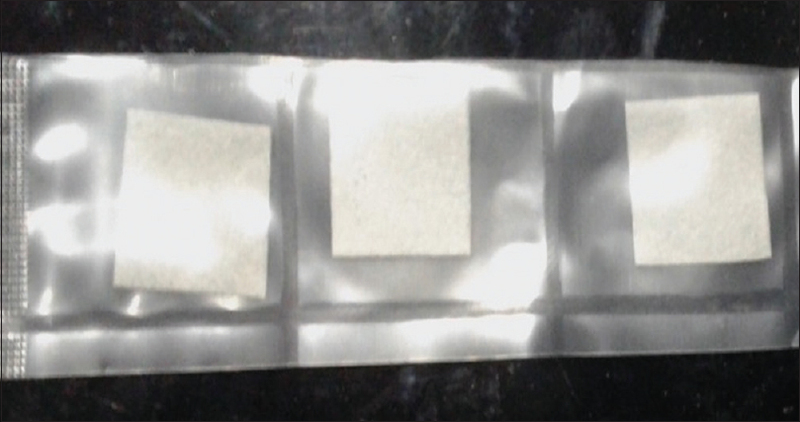 Background: Guided tissue regeneration is a very commonly employed technique for treating recession defects. However, achieving the required space beneath the membrane is often difficult. Aim and Objectives: The purpose of the present study was to compare and evaluate the clinical efficacy of coronally advanced flap (CAF) alone or in combination with amnion membrane (AM) or chorion membrane (CM) and demineralized freeze-dried bone allografts (DFDBAs) in the management of gingival recession (GR) defects. Materials and Methods: The sample size (Miller's Class I and Class II GR-type defects) consisted of thirty patients which were stratified into three groups randomly (ten for each group). 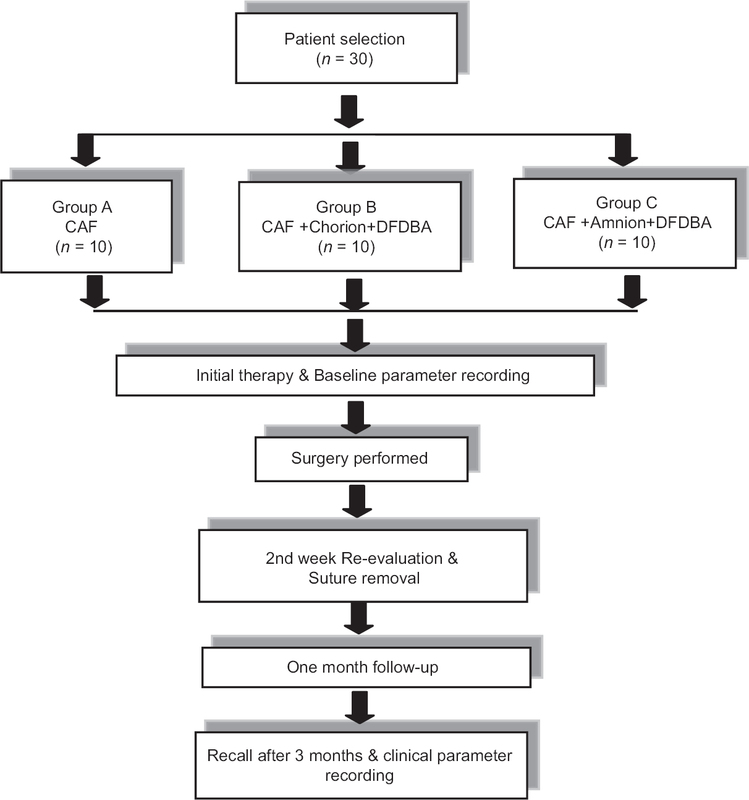 Group A patients were treated with only CAF and Group B patients were treated by CAF in combination with CM and DFDBA. Similarly, Group C patients were treated by CAF in combination with AM and DFDBA. Clinical parameters such as gingival index, GR depth, GR width, relative attachment level, and width of keratinized tissue were assessed at baseline and 3 months postoperatively. Results: Inter- and intragroup data were analyzed by paired t-test. The percentage of root coverage obtained in the study groups was 60%, 78%, and 63%, respectively, for Groups A, B, and C. Statistically significant difference was obtained in the clinical parameters of Group B which was treated with CM and DFDBA. Conclusions: Combination of DFDBA and placental membrane (chorion/amnion) in CAF procedure provided an additional benefit over CAF alone in the treatment of Class I and II GR defects. Background and Objectives: Socket preservation is the procedure which is carried out at the time of extraction to enhance the esthetic predictability of prosthesis and to reduce the number of surgical interventions by minimizing the crestal bone loss. The aim of the present study was to compare the efficacy of natural bovine hydroxyapatite and platelet-rich fibrin (PRF) matrix along with collagen plug to unassisted natural healing in extraction sites. Materials and Methods: A sample of 25 patients of age 17–50 years who require extraction of at least two teeth which were not adjacent to each other were included in the study. One site in each patient was subjected to ridge preservation procedure using Cerabone™ PRF along with collagen plug and the other site was subjected to atraumatic extraction alone. Parameters such as loss of ridge width and loss of ridge height were measured clinically and radiographically at baseline and after 6 months. Results: The mean loss of width was found to be 2.75 mm (2.75 ± 1.49) at the control site compared to 1.47 mm (1.47 ± 1.44) at the test site. The test site showed 2.31 mm bone fill, (8.7%) compared to the control site. Conclusion: Within the limitations of the study, the results suggest that socket preservation procedure is a reliable method that minimizes the alveolar bone loss. Background: Root coverage procedures have gained much popularity in recent years, due to increasing esthetic demands of patients. Coronally advanced flap (CAF) is a predictable technique for treating gingival recessions. Platelet-rich fibrin (PRF), an autologous platelet concentrate, has properties to enhance soft-tissue wound healing. A current method in dentistry is the use of human chorion membrane, a placental derivative, having biologic properties that help in healing and regeneration. Thus, the aim of the study was evaluation and comparison of the efficacy of chorion membrane and PRF membrane in the treatment of Miller's Class I and Class II recession defects. Materials and Methods: This was a randomized controlled clinical study. Totally 30 sites with Miller's Class I and Class II recession were taken and randomly allocated to chorion membrane (test) PRF membrane (control) group. The clinical parameters recorded were clinical attachment level (CAL), recession height (REC-HT), recession width (REC-WD), width of keratinized gingiva (WKG) and gingival tissue thickness (GTH). Results: Significant differences were seen from baseline to 6 months in test group regarding gain in CAL (P < 0.001), reduction in REC-HT (P < 0.001), decrease in REC-WD (P = 0.02), increase in WKG (P < 0.001), and increase in GTH (P < 0.001). In the control group also, significant difference was noted at the end of 6 months i regarding gain in CAL (P < 0.001), reduction in REC-HT (P < 0.001), decrease in REC-WD (P = 0.029), increase in WKG (P < 0.001), and increase in GTH (P < 0.001). Intergroup analysis showed significant differences between test and control groups at the end of 6 months, with CAL, REC-HT, WKG, and GTH showing statistically significant differences with P = 0.002, 0.001, 0.001, and 0.026, respectively. No significant difference was seen regarding REC-WD (P = 0.39). Conclusions: Both are effective materials in root coverage, but chorion membrane showed better and more stable results at the end of 6 months as compared to PRF membrane in treating gingival recession. Background: Recent cross-sectional studies have suggested that chronic inflammation resulting due to gingival and periodontal diseases may have potential reversible risk factors for dementia. Recently, cognition, memory deficit, and along with the behavioral defect have been considered as characteristics of dementia. Age is one of the main factors which is also known to be associated with dementia. The aim of the present study was to establish the correlation between tooth loss and diagnosis of cognitive impairment/dementia in elderly patients. Materials and Methods: A cross-sectional study, comprising of 300 patients (Age: 50–80 years), was conducted. For the assessment of cognitive impairment/dementia, Mini-Mental Status Examination (MMSE) was conducted. All the results were analyzed using the Chi-square and Kruskal–Wallis ANOVA test. Results: Number of teeth was found to be directly associated with MMSE. Less number of teeth was associated with lower MMSE score, irrespective of gender. The level of statistical significance was found to be P < 0.001. Factors, such as socioeconomic status, school education, and marital status, were found to have a statistically significant impact on the dementia scale. Conclusion: The current study found a significant association between tooth loss and cognitive impairment. Along with age factors such as socioeconomic status, education, and marital status were also found to have a direct or indirect impact on dementia. More prospective studies and clinical trials are required to be conducted to confirm the observations of this study. Aim and Objective: The aim of this study was to assess the oral hygiene status, oral hygiene practices, and periodontal health among brick kiln workers of Odisha. Materials and Methods: Four hundred and eight subjects (300 males and 108 females) between the ages of 22 and 65 years with mean age of 33.44 ± 2.34 years working in various brick kilns in the district of Khordha, Odisha, participated in the survey. Data were collected through personal interview and clinical examinations. Results: Overall prevalence of periodontal diseases among brick kiln workers was 86.27%. There was a statistically significant difference in the distribution of Community periodontal index (CPI) (P < 0.001) and loss of attachment score scores (P < 0.001). Periodontal disease was significantly associated with age, oral hygiene status, practices, and tissues abuse habits. Most of the workers were males (59%), in the age group of 30–40 years (40.69%), having only a primary level of education (75.98%) and were married (80.88%). Majority of the workers brushed their teeth once daily (78.9%) with toothbrush (51.5%) and used toothpaste (41.2%). Most of them were found to be consuming paan or gutkha as compared to cigarette or beedi smoking. Among the subjects with a CPI >2, higher prevalence of periodontal disease was seen in subjects older than 50 years of age (86.7%), those brushing once daily only (75.2%), brushing with finger (82.8%), with higher frequency and duration of consumption of tobacco and alcohol, and having a poor oral hygiene (85.5%). Conclusion: The survey among brick kiln workers revealed that the oral hygiene status was poor, they had ill-informed oral hygiene practices and most of them were suffering from periodontal disease. Mucosal fenestration is a clinical finding in which a portion of the tooth root is denuded of the overlying alveolar bone and gingiva or oral mucosa, thus exposing the root to the oral cavity. If left untreated, they may be a source of infection by giving entry to oral pathogen, leading to further progression of periodontal disease. Depending on their site of presence, they may also be a reason of esthetic concern to some patients. 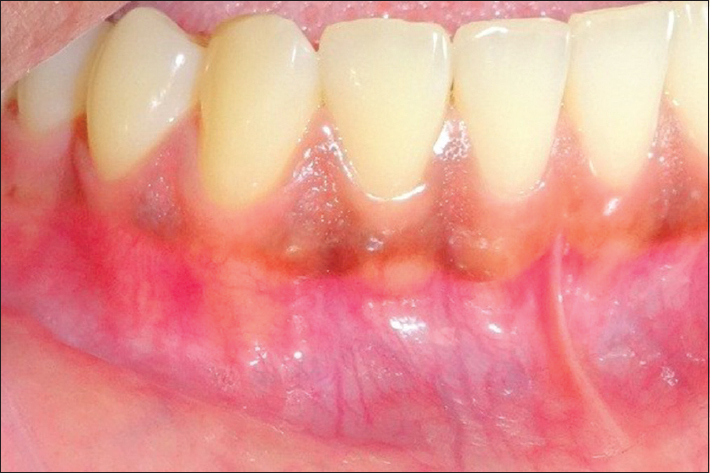 This paper reports one such infrequent case of mucosal fenestration of lower incisor region that was well treated by an interdisciplinary approach and regenerative therapy. Attached gingiva plays a promising role in maintaining periodontal health. An adequate width of attached gingiva prevents plaque formation and soft-tissue recession. Among various techniques for augmenting width of attached gingiva, modified apically repositioned flap (MARF) is a simple and easy procedure that does not require a second surgical site. It is less time-consuming. It provides better operative and postoperative comfort for the patient. In this case series, MARF technique was used for augmenting the width of attached gingiva. 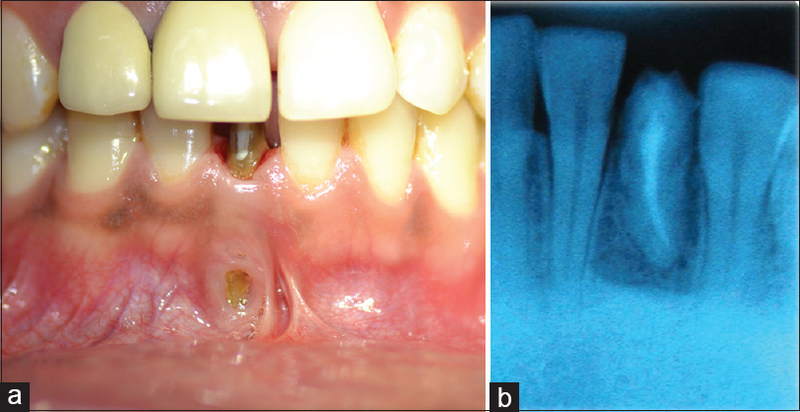 Peripheral ossifying fibroma (POF) represents a non-neoplastic, reactive lesion of gingiva. The precise etiopathogenesis of POF is unclear; however, it is suggested to originate from the connective tissue of periodontal ligament. This lesion predominantly occurs in the maxillary anterior region. The standard treatment protocol involves surgical excision followed by the biopsy of lesion. The reactive nature and unpredictable course attribute to a high recurrence rate of the lesion; hence, proper postoperative monitoring and follow-up of the lesion are necessary. The present case was surgically managed using diode laser and did not show any sign of recurrence during the follow-up period of 6 months. Minimum intraoperative bleeding and postoperative pain, ease of operation, and patient's acceptance enable laser-assisted growth excision as a better treatment modality to other conventional surgical procedures, thus offering diode laser as a viable and effective treatment alternative in the management of massive overgrowth.